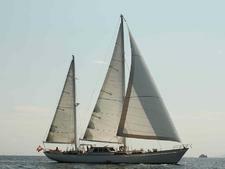 Built in 2006 to resemble a 19th-century schooner, the 100-foot Raja Laut is one of 10 vessels owned by Burma Boating. With accommodation for 12 passengers, and crewed by a team of six or seven, the vessel sails on five-night cruises and private charters in Myanmar's Mergui Archipelago. The ship has a chef, and cruises include all onboard meals, water and nonalcoholic drinks. Behind the classic lines of the vessel is a modern luxury sailing yacht, equipped with the latest in navigation and satellite technology. Onboard amenities include scuba diving facilities. The six double cabins each have rich timber interiors, ensuite bathrooms, air conditioning, showers and electric toilets. Three cabins have queen-sized beds and three have bunk beds. Centrally located between the cabins is the main saloon, which consists of large settees in a U-shape configuration around a coffee table. The saloon has a flat-screen TV with DVD player and an internet access point. The main deck house contains the dining area, which has two tables and enough room to accommodate all 12 passengers. The galley is separated from the dining area by a breakfast bar. The spacious open deck area can accommodate a dining table for al fresco meals, and there are plenty of places to sit and sunbathe. 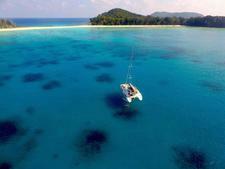 The best time to sailing the Mergui Archipelago is between November and the end of April. Meta IV is a classic wooden two-masted yacht designed by the famous American naval architect Thomas E. Colvin and made entirely of Thai teak. Meltemi is the first and only catamaran in the fleet of 10 yachts owned by Burma Boating. The French-built Lagoon 500 vessel was previously owned by a Malay princess and joined the Burma Boating fleet in 2015.